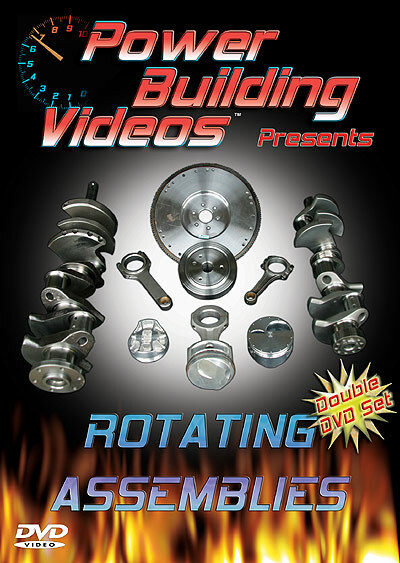 ROTATING ASSEMBLIES - This Double DVD set contains approximately 3 1⁄2 hours of highly detailed, yet easy to understand information on how to choose the right parts for your engine before it gets built. You’ll be taken through many types of cranks, rods, pistons, rings, bearings, harmonic balancers, flywheels, balancing, and everything else you can imagine that involves the internal rotating assembly to see the comparisons between them all. Building an engine is one thing, knowing which internal components to use for a given application, and why you would choose those particular parts is another, and that’s just what you’ll learn in this show. Arron explains the features, advantages and disadvantages of each part, and why you would, or wouldn’t want to use a particular part for your engine, from stock, to street performance, to all-out racing engines. Should you run a cast, forged or billet crank? What are the differences and how can you tell? Which alloy is the best? Should you increase the stroke or decrease the stroke? Which rods should you go with? I-beam, H-beam, steel or aluminum? What length should you use? What about rod angles and piston side loading? Which pistons should you use? Cast, hypereutectic or forged? Domed, dished or flat tops? Floating or pressed pins? Will you need oil rail supports? Which bearings should you use? Will they hold-up to heavy loads? Do you need cast, moly, plasma moly or gapless rings? What is balancing all about? What’s the difference between internal and external balancing? What does “balanced and blueprinted” mean? Should you use an aluminum or steel flywheel? These questions and MANY, MANY more are answered in this show. KNOWLEDGE IS HORSEPOWER! Click on the link below to see some previews of this title.